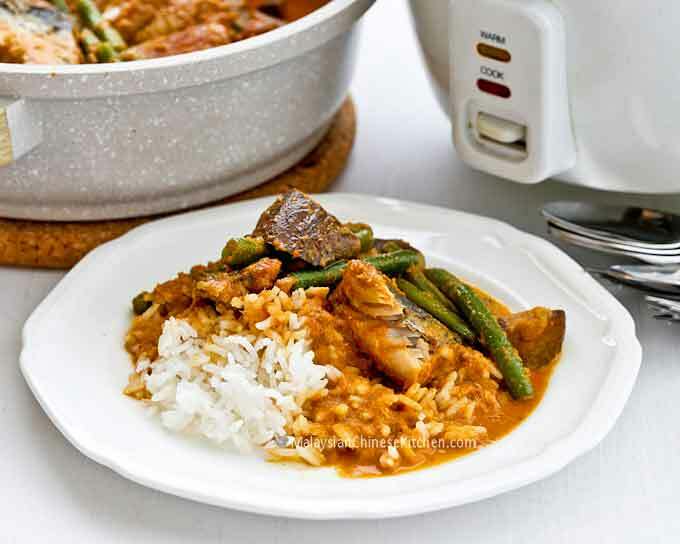 This Salted Fish Curry is an adaptation of the Nyonya version using freshly salted fish instead of dried salted fish. It is just as delicious! 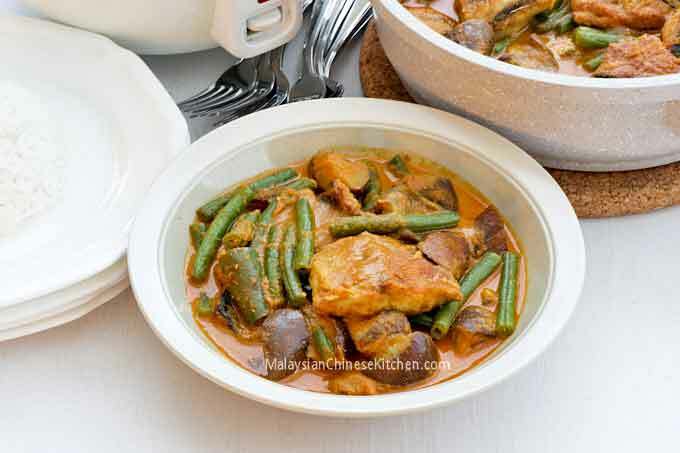 Nyonya Salted Fish Curry (Kiam Hu Kut Gulai) is a super delicious dish that should be more widely known. It is actually made using salted fish bones. 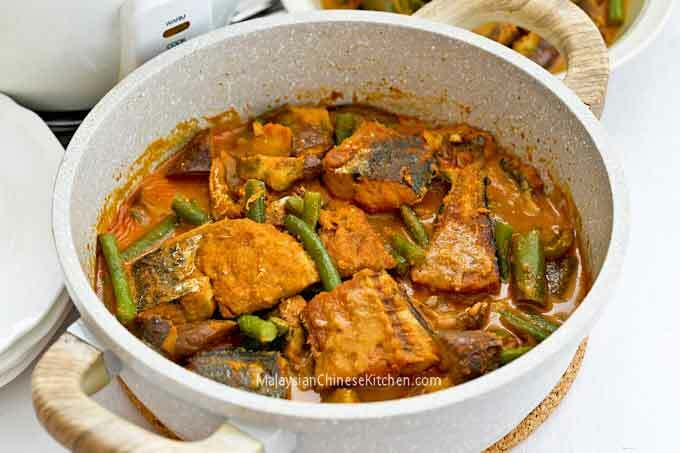 Instead of discarding the bones, a thrifty came up with this idea of adding it into a delicious vegetable and tofu curry which became a favorite in many Nyonya household. In Malaysia, There are a variety of salted fish and most are dried. Little fish are usually salted whole. They are fried to a crisp and eaten whole. Bigger and firmer fish are filleted before being preserved into Tanau Kiam Hu (popular in Penang), similar to this Mergui Salted Fish. Once considered poor man’s food, this kind of salted fish is now pretty expensive. There is yet another variety of salted fish known as méi-xiāng (mui heung) salted fish with an intense salty flavor which usually crumbles once fried. When I was growing up, this version of salted fish, also known as Kuantan Ham Yee (in Malaysia) was very popular in the state of Pahang. 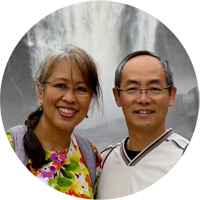 People from all over the Peninsular would buy a salted fish home when they happened to visit. 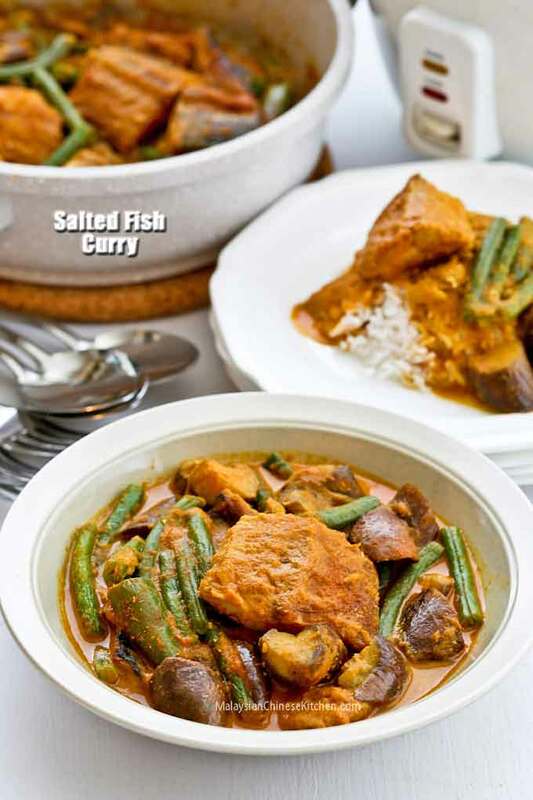 This salted fish is made using fish with larger bones which is suitable for use in this curry. Unfortunately, there is not even the slightest chance of me getting Kuantan (mui heong) ham yee here in the US and I am not even going to try to look for it. That said, I was delighted when I came across these freshly salted mackerel fish when grocery shopping in Westminster, Colorado recently. I picked up two packets and knew exactly what I was going to make with them even though I have never tried them before. 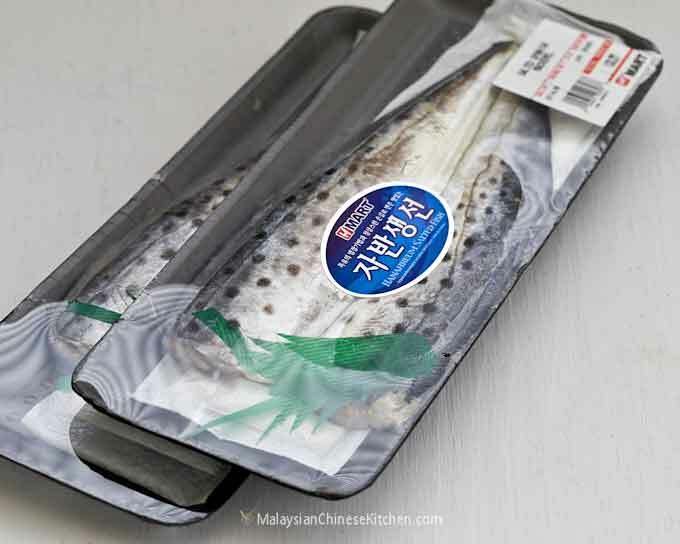 They reminded me of sek hu/sook yee which are usually chubb mackerel boiled in salt water, sometimes used in curries. I thought had everything I needed and couldn’t wait to get home to cook this Salted Fish Curry. In my excitement, I had forgotten to buy deep fried tofu puffs. It is 40 miles one way to the Asian markets close to Denver and I wasn’t going to drive south again just to pick up some tofu. If you can, please add some to yours. The flavor of Salted Fish Curry as I know it is there although just subtly. This curry also has a lot more fish meat and that is actually a good thing. I will certainly cook this again and the next time it will be with deep fried tofu puffs. If you are using dried salted fish bones, you will probably not need 1½ pounds of it. Please adjust accordingly. Also, you will have to rehydrate by soaking them for 30 minutes or so. Blend shallots, garlic, lemongrass, and ginger with 2 tablespoons water until smooth. Transfer to a small bowl. Add fish curry powder and chili powder to form a paste. Heat vegetable oil in a medium deep pan. Fry salted fish for 3 minutes on each side until lightly brown. Remove and set aside, leaving the oil in the pan. Add spice paste and stir fry for 3 minutes. Add jalapeno peppers. Continue to stir fry for another minute. Pour in coconut milk, cover, and bring to a boil. Remove lid. Return fried salted fish to the pan. Cover and allow curry to simmer for 5 minutes. Remove lid, add eggplants and green beans. Cover and bring it back to a boil. Remove lid, stir, and do a taste test. Add salt if necessary. Cover and simmer for 10 minutes or until eggplants and green beans are tender. Turn off stove. 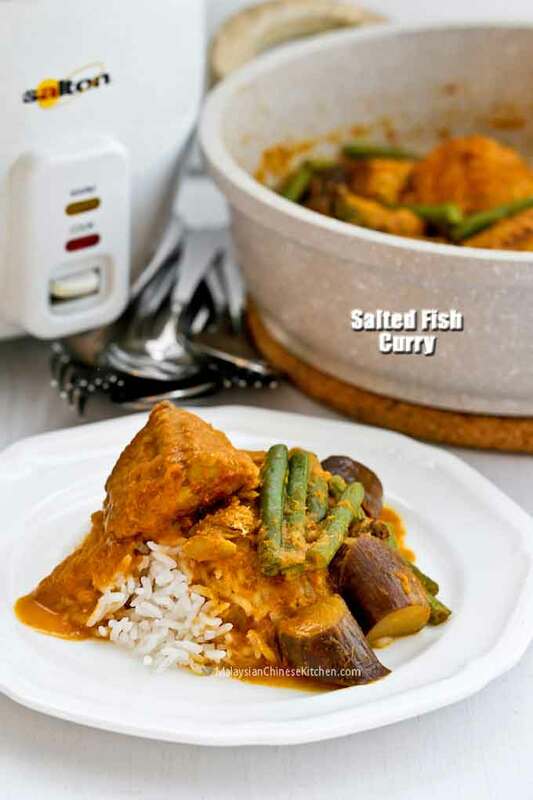 This Salted Fish Curry is super yummy served with steamed rice. You don’t really need anything else as the vegetables are in the curry itself. If you still prefer to have a side dish, I would recommend something really easy to prepare like this Green Beans Omelet or this Omelet with Chives and Onions.